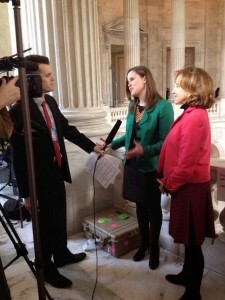 On Tuesday, January 28 I had the opportunity to attend the eighty-first live State of the Union Address as a guest of Senator Kay Hagan. The experience was truly a once-in-a-lifetime opportunity, and I was honored to be one of only three educators in attendance as guests that night: the other educators included Michelle Obama’s guest, a teacher from DC, and a Head Start teacher from Ohio. In thinking about my experiences that day, I found myself coming back to this poem about President Kennedy’s Inauguration by Linda Pastan. I love the way it captures a moment in time and a feeling of change: the youth of Kennedy mingled with the aged wisdom of Robert Frost, the poet at the inauguration. At that moment, the United States was at a crossroad of change: a path of the future that clashed with the past, a new presidency that signaled many firsts for our country. Although I couldn’t think of a clever pun like Pastan does with “Frost” for my poem’s title, I still wanted to emulate her poem to capture my experiences at the State of the Union Address this week. The feelings of hope and change from old to new particularly resonated with me during my experiences. The day was a whirlwind of activities, filled with media interviews via satellite from the Senate Press Room, with live on-camera reporters in the Capitol Rotunda, and even a live phone conference that I conducted behind Senator Hagan’s desk. After the press activities were finished, I took the US Capitol Subway in the tunnels to the Capitol, where Senator Hagan and I ate dinner with the other senators and their guests. The experience at dinner reminded me of the importance of finding opportunities for dialogue among our educators and the legislators who greatly influence policies that affect our classrooms. In conversations with senators from other states, I learned about the similarities of needed changes in our schools—reduced class sizes, technology infrastructure upgrades, improved resources, plans to recruit and retain quality teachers, and equity of access to rigor and educational opportunities. I was also able to share some of the areas that North Carolina needs to improve, many of which will not come as a surprise to people in our state. We need to work together to improve the status of teachers in our state, and that includes improving teacher compensation and offering more opportunities for career development and sustainability in the future. In addition, I learned a more “microcosm” lesson as I ate dinner beside the Senate Curator, who shared some of the history of the artwork in the Capitol with me. My mind immediately drifted to how I could use some of the beautiful, detailed artwork in the Lyndon Baines Johnson Room in my classrooms—teaching students how to “read” and analyze visual texts as well as written texts. 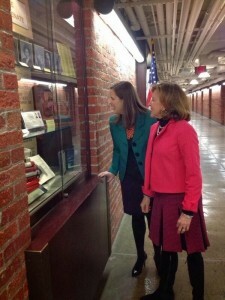 I also felt the weight and power of history as Senator Hagan took me on a brief tour into the Senate Chamber. As I walked into the space where so much history has been changed and created, I felt deeply connected to a past that shapes who we are and to a future that my students will one day construct. I said my farewells to Senator Hagan and went with the other guests to the House Gallery. The leaders of our country entered the House Chamber, and for the first and probably only time in my life, I watched the State of the Union not just as a spectator, but a participant. My heart swelled with pride for my colleagues as President Obama opened his speech by addressing the countless hours teachers put into ensuring student success every day. I clapped with the crowd as President Obama made comments with which I agreed and remarks that made us laugh (I loved the Mad Men comment! ), stood up with others and at times on my own when something deeply resonated with my beliefs, and I cried along with American citizens when Cory Remsburg, the Army Ranger, was honored for his service and drive to “never give up and not quit.” The comments on education concerning early childhood education, technology, and affordable college loans deeply coincided with my beliefs, and the overarching message of the speech on equity, access, and opportunity for all United States citizens, regardless of socioeconomic status, race, gender, sexuality, age, and cultural background aligned deeply with what educators seek for our students daily. We want all of our students to have the chance to dream big, to seek more than what life puts in front of them, and to live a life they once only imagined. As the evening came to a close, I went back to the Dirksen Senate Office Building via the tunnels, but I elected to walk alone instead of ride the subway with the others. As I walked past the flags and seals of our states and territories, I thought about the state teachers of the year I had just met the week before at the National Teacher of the Year Conference in Arizona (a blog on that experience is in the works). I also thought about all our students and the opportunities I want them to receive. My walk brought to mind the feeling of “weight and power” that I felt within the Senate Chamber. I was reminded that we have a lot of work to do to make sure our schools keep moving forward with and for our students, and I am ready to keep working for all of them. After reaching the Dirksen Building, I stepped out into the freezing night air. To my surprise, snow was falling all around me in large, glimmering flakes. You see, guests are not allowed to take cell phones into the State of the Union, and I chose to leave my phone with my husband instead of checking it with security at the Capitol. In fact, I hardly ever had my phone on me the entire day. The result of my day of disconnect from technology meant less pictures, but it also meant more memories stored within my heart and my mind. I wrapped my scarf around me, pulled up the hood on my jacket, and walked fifteen minutes to meet my husband at a restaurant where he had watched the State of the Union. As I walked past the brilliant white façade of the Capitol that was made even more glistening by the falling snow, I felt at a crossroad of the past and the future. Due to security around the Capitol and the falling snow, the streets were almost completely silent. It was like a moment frozen in time during which I could reflect and relive all that I had just experienced. It was also a moment where I could start to plan for the future, not just for me, but for all the students I teach and all the students who are taught across our country. As I put one foot in front of the other, I knew that the journey for them and for me was only just beginning.